Did you know that listening to your favorite classical music playlist is actually good for your health? That's right; there are numerous benefits one gains from listening to classical music. In fact, there have been numerous studies done that prove that listening to classical music has both mental and physical benefits. For instance, listening to classical music can help reduce stress levels and supercharge memory. According to an Oxford University study, classical music was effective at lowering participants' blood pressure. In addition, researchers found that those who listened to Mozart's music showed an increase in brain wave activity that's linked directly to memory. So, next time you're tempted to take a nap to relax after a hectic day or drink another cup of coffee to concentrate on an important task, try putting on some classical music instead. 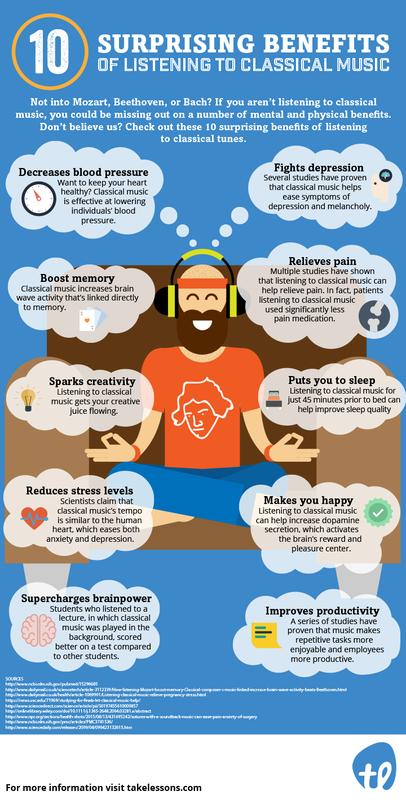 Check out some more amazing benefits of listening to classical music in the infographic below. This article originally appeared on TakeLessons.com. Brooke Neuman is a music editor at TakeLessons, an online marketplace that connects thousands of teachers and students for local and live online music lessons.